A certain harmony graced Javier Villamizar when, through his work at Motorola Ventures, he found himself serving as a consultant in the early 2000s to Marcelo Claure, the founder and former CEO of Brightstar and current president and CEO of Sprint. It started with conversations wherein Claure expressed interest in expanding his new company Brightstar, a distributor of Motorola’s phones at the time. Within months, Claure had the investors he needed to make his expansion dreams a reality, and soon after, he asked Villamizar to come on board as president of global distribution. The decision wasn’t a difficult one for Villamizar. Brightstar is currently the largest known provider of distribution and value-added services to the wireless telecommunication industry. It provides mobile phone-related services to operators and retailers worldwide—a world that had plenty of growing to do when Villamizar first started, considering it primarily served only Latin America. “My mission was basically to expand, both geographically and in terms of services offered by the company,” he says. And after what amounted to a “five-year road trip” through Asia, Europe, the Middle East, and Africa, he ultimately engaged with enough attorneys, accountants, and warehouse workers to start operations for Brightstar in 30 new countries. “I was going to these manufacturers and saying, ‘Now I can serve you in India, Nigeria, etcetera’… and they’re making that connection and developing the business,” Villamizar says. Brightstar eventually took up residence in North America, around the same time that the wireless world was shaken up with the introduction of smartphones. “It really made us think through what we were going to bring to the ecosystem in the future,” he adds. By embracing that mission as both an opportunity for the company as well as a form of corporate responsibility, Brightstar became re-invigorated. “There are people in India, or Nigeria, or Columbia, that don’t have $500 or more to buy a new high-end smartphone, but they might be able to purchase an older one,” Villamizar explains. Of course, the industry is centered on innovation, first and foremost. 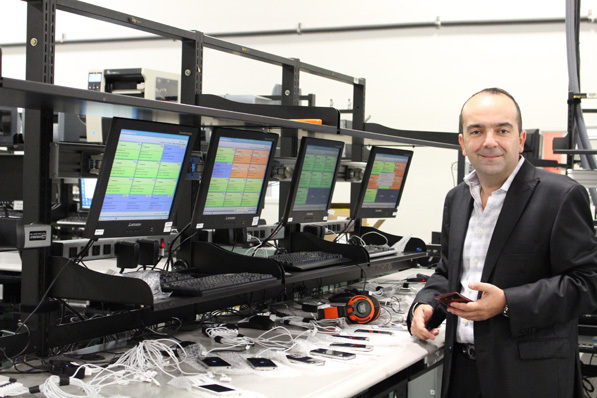 One way Brightstar stays competitive, in that regard, is by creating “sophisticated inventory replacement models” where, according to Villamizar, they can monitor customer demands in real time and purchase the precise number of phones necessary. This lets the company help operators be more efficient with capital and inventory management. Another key to efficiency for Brightstar is its connection with SoftBank, Brightstar’s parent company and a sizable investor in hundreds of IT- and Internet-related companies, which allows Brightstar to adapt innovations from those companies into its business. “Now we’re working with the biggest device manufacturers in the industry to bundle that content and those applications,” Villamizar says. When it comes to taking all that Brightstar offers into even more parts of the world, Villamar has learned some interesting lessons, having witnessed millions of dollars in phone inventory make its way through Mexico under only the tightest security. “We went to Singapore with that same mindset of [security] needs,” Villamizar says.